Enter the howlways of school with this cool Monster High Monster Minis Playset that comes with a Draculaura mini-figure! Multiple floors offer a colorful design, iconic elements, and fun surprises from all angles. There are coffin-shaped windows, cats, bats, and spider webs. 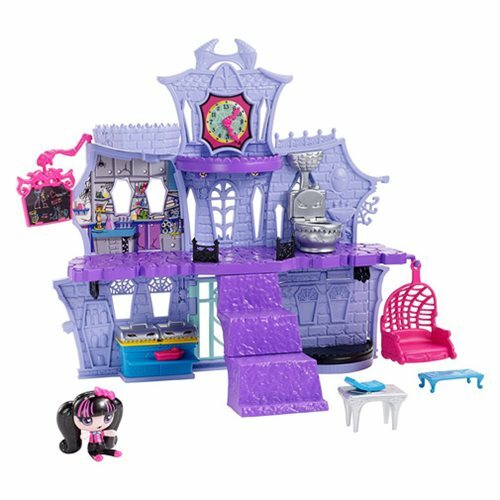 Young ghouls can play out all kinds of fangtastic castle adventures with this Monster High Monster Minis Playset. Collect all the Monster High Minis and accessories (sold separately) to fill the high school with monster fun! Ages 6 and up. On the first floor, young ghouls can lift the lid on the stove in the kitchen to reveal monster food, let Draculara fang out in the pink swing, or magically move a mini-figure using the bookcase in the library - just spin the room to make a mini-figure appear or disappear. Head up the giant purple steps to the second floor. In the bathroom, a pull of the flush handle on the silvery toilet pops up the lid and knocks the mini-figure atop it off. The study is a great spot for Draculaura to do her homework. There's a desk with a spot for her laptop, a bench with hearts, and a board with colorful notes. The clock tower holds a napping spot for Draculaura. Open its face to let the daughter of Dracula sleep hanging upside down. When the clock face is closed, a bat pops out. At the very top, a rooftop turret is perfect for letting imagination take flight! Looking monster cute with black pants and suspenders and a pink shirt with blue heart buttons and bowtie details, the Draculaura mini-figure is ready for all kinds of stories. Her dark pink-streaked pigtails are signature style, with a pink bow and a dramatic sweeping look.